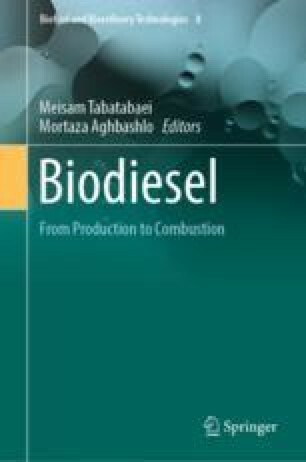 This chapter reviews the applications of biodiesel by-products. The biodiesel production process is predominantly carried out through transesterification of triglycerides with methanol. Besides the desirable methyl esters, this process provides other products including oil cake/meal, crude glycerol, methanol, and biodiesel wash-water. Oil cake/meal are solid residues obtained after oil extraction from the seeds. The by-product of the transesterification step is crude glycerol. To remove the impurities, crude methyl esters will be washed out which result in the biodiesel wash-water that is another potential by-product. Many applications are known for the aforementioned by-products and also the unreacted methanol. This chapter starts with a brief introduction on biodiesel process. It will continue with reviewing applications of biodiesel process’s by-products and unreacted methanol.